Artificial intelligence capabilities are advancing so quickly that AI is now universally relevant to C-level executives across all industries. And that’s exactly who was in attendance Tuesday morning. 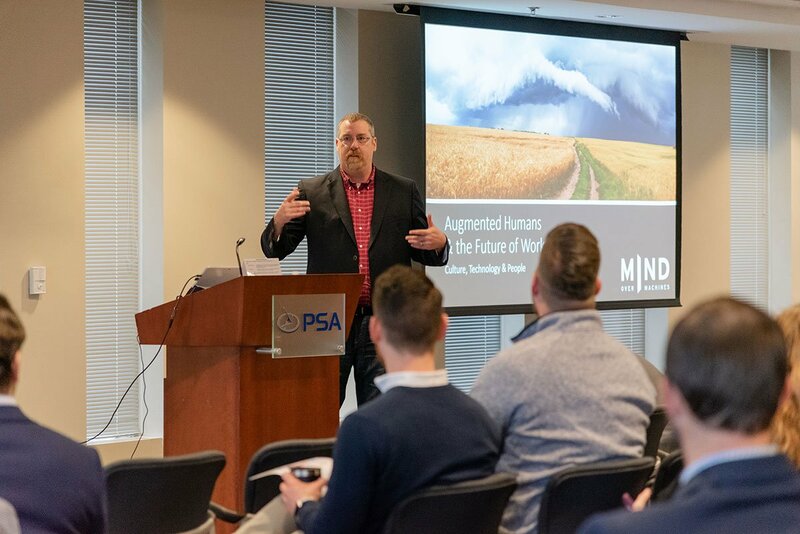 “We knew Tim would be able to illuminate this hot-button topic for our partners by making it accessible and human-centric,” explains PSA Marketing Coordinator Lindsay Schneider. As people and culture disrupt the workplace, the nature of work changes. Work is no longer something we go to; it comes to us. In the Augmented Human Age, work is about creativity, knowledge management and building relationships. AI: Artificial intelligence provides deeper engagement and compelling experiences with your brand, stories and relationships. BI: Business intelligence turns company data into actionable insights. CRM: CRMs track relationships, not customers and transactions. Your CRM can be your most powerful storytelling tool, and telling your story is how your company builds value. All three of these technologies have miraculous automation abilities, but they automate to enhance people, not replace them. Use the ABCs to gift your employees with time – time to be more human, more creative, connective and effective. Whenever our MINDs present to executives, people want tips for staying up on the latest technology. Fear of disruption is real. But frankly, it’s a lost cause. There’s just too much moving too fast. You’re not going to be able to “keep up with technology,” in that generic, umbrella sense. Why bother? Your time is better spent finding the technology that can bring value to your company. What do your people need to be successful? Focus on providing that technology. Keep up with that technology and make it work for you. In the never-ending quest to grow your company and your bottom line, tech shouldn’t drive your business, but it should inspire your business. It can help you capitalize on the assets no disruption can ever steal away: your minds, your story, your vision. When Mind Over Machines implements emerging technologies, we start with those assets. We get to know them and configure systems to support and enhance them. Augmenting humans isn’t just what we do, it’s the future of technology and the workplace.